“Very” light rail: Much of the cost of building light rail is in the support investment (ballast) under the tracks and the cost of electrical support. The driverless technology is also beneficial. The idea really solves many design/cost problems. Maybe the tracks can even be light enough to not require monolithic concrete towers and bridges! Lighter vehicles do have collision safety issues if they cross anything. As research progresses, it will be interesting to see if the concept can be designed to be less intrusive for a neighborhood streetscape, or if the collision risks will hamper the concept. The problem with ultralight rail is, if you don’t have “masses” of people to move then rail isn’t the right answer. Autonomous vehicles have made great strides forward. Japan already has working vehicles that are ideal for say moving people around large factories or assembly areas. If you have a “light” load then the flexibility of a rubber tired vehicle can’t be beat. Consider just the maintenance issues involved in a rail system vs something that can drive to a garage or onto a trailer/tow truck. Right, hyperloop is about “I want to travel fast in my own car alone or with just my family. If I have to travel in a shared car (light rail) I want it small with only a few people.” They’re thinking about their individual desires, but not how that scales to a city of a million people or a state of forty million people. It’s like how Uber caters to “I want a taxi when I want it, going to exactly where I want to, with no other people except the driver.” Again it may work for your individual case, but it can’t serve everybody’s trips in a city of 850K (San Francisco where it began), many of whom can’t afford a $10-20 fare every trip. And the bulk of its use is not on the outer areas or in last-mile transit holes at odd hours, but in the inner city peak hours going between areas that have the best transit. I get what you’re saying, but for all the problems of Uber and Lyft, it does play an important role when you’re trying to get around to and within the Eastside during the off hours, when all the buses (except for the B-line) are running hourly. In other words, the presence of Uber and Lyft means I can ride transit when it works, without being captive to it when it doesn’t. Ideally, we’d have transit running more frequently, and with more direct routes, to avoid the need for services like this, but say we’re just supposed to put up with bad service for years or decades, until Metro gets around to improving it is not reasonable. And if people riding Uber around between Fremont and Belltown is what is necessary to create the demand to allow the business to exist, so that it can carry me places where the transit isn’t as good, I say, so be it. In the article they talk of 50 passenger cars moving under battery power. In other words, it’s basically the streetcars TIG/m has been building for years with a different name to appeal to a city rather than a resort or tourist market. TIG/m Streetcars operate on standard gauge track and do not require any form of wayside power system. All electrical power required for a full day of passenger service is carried on-board the vehicle. There’s no way carrying that battery around can be “Very” light. They also say their ” streetcars are designed, manufactured, and tested to comply with international Light Rail Standards.” So what they are doing is the equivalent of what Proterra is trying to do with respect to replacing trolley buses. But as we know “off wire” capacity is a trade off with the weight and expense of larger batteries. A few weeks ago, my wife and I went to a restaurant along Rainier Ave. I noticed that while it has overhead wires set up, none of the #7 buses that drove by were trolleybuses. Why is that? Was it a weekend? Metro “dieselizes” trolley routes almost every weekend. I think it was a Saturday night, so that’s probably it. Why do they do that? Metro uses diesel buses on their trolley routes on many weekends because of construction and community events that take place that may require reroutes. I thought a lot of trolley buses had what’s called an ESS mode, or a battery backup mode, where a trolley bus can go off-wire for a period of time, to get around obstructions. Seems like it could be used to get around construction and community events on weekends. And I’ve never fully believed Metro’s official explanation as to why they run diesels on weekends. Their stated reason sounds plausible, but I think it really has more to do with reduced manpower on the weekends. Less workers available to quickly respond and get polls untangled from wires, etc. For a while they were also running diesels to extend the life of the trolleys back before the new ones arrived in 2015-ish. You’re right that the new buses have battery backup, and it’s not just two blocks. I think generally they’re good for three to four miles, which means almost any neighborhood event could be bypassed. However, it takes a while to retract the poles at the beginning and re-wire at the end of a detour, so it makes more sense on the weekends, when there are plenty available, to run diesels. They don’t send folks out to re-wire, though that might be a reasonable way to speed up the process if it were for a planned detour. The driver does it normally. Metro refuses to operate trolley buses off wire, even though they demanded they have this capability. It has been 6 days. I have ridden up and down third probably 8 Times. I have yet to see a person utilize all door boarding. I also have yet to see a single staffer out helping people. Such a great benefit! Huh. The one time I’ve ridden the bus since then (I normally walk), I boarded at 3rd/Cedar, the 124 pulled up, I tapped at the reader there and boarded the center door (the driver opened all doors at all stops as you would expect). Fare enforcement actually boarded at Wall and checked passes/transfers as well. Survey sample size of one, but I didn’t have any issues with doing it. No boarding assistance as there’s already a reader at 3rd/Cedar. I live in Portland and feel the exact same way about my city. Portland city officials are far better at marketing themselves as green and transit/bike-friendly than actually doing the work to make this farce a reality. For people who actually live here, we have to deal with buses that don’t show up, half-assed bike infrastructure (that the city actively removes sometimes without warning), closed-off sidewalks, cars parked up to the corner so you can’t see when crossing the street, and surface-running light rail trains that stop at every red light downtown. Any time you try to bring up any shortcomings to city officials (or other advocates tbh, the brainwashing runs deep in this town) they passive-aggressively tell you that you’re wrong or just don’t understand “how we do things here” and proceed to tell you how great Portland is. Amen! That’s been my experience, too. I moved here from Minneapolis, and while I really like Portland, my impression is that the city is very over-hyped. It has a ways to go before living up to the reputation it has somehow acquired. People here can get very resentful if you’re critical. I’ve been told to go back home before. *shrugs* Then, the whole West Coast has a bit of this braggart spirit of progressiveness without always living up to it. In fact, it’s been stunning to me at times just how far it often falls short while no one seems aware. Being labeled progressive can be nice, but it can also go to one’s head. It takes vigilance and constant work to remain worthy of the accolade. To some extent this always happens. My family has been in a few minor newspaper articles, and I always find the report is cursory or they don’t quite understand some aspects. When I was in Russia and Northern Ireland, I saw that the local newspapers (in Russia’s case, the expat English newspapers, in the Yeltsin era) where far more detailed and accurate than what gets published abroad. As I’ve had more exposure to foreign correspondents themselves, I’ve seen that the reporters understand what’s going on, but it doesn’t make it through to the published article, whether because they had to fit it into a few hundred words, or they couldn’t explain it to an audience that doesn’t know the background, or an editor whittled it down to what s/he thought readers would want. I saw the same thing about American music and how people live. 90% of the TV shows and movies and music in Russia in the 90s was American, and people thought they knew all about it. But at least 50% of the of the minor jazz and rock bands and different kinds of music, small movemements, and all the other aspects of our vast culture that never get into the top 40 or even 400, they don’t know about. Conversely when I went to England and Ireland, I saw that there were a huge enormous number of things I had never heard about, and which you really have to spend some time in the country to understand, they just aren’t communicable outside the region because there’s so much of them. The same thing seems to happen in the disconnect between what we experience in Seattle’s transit network and urban live — some improvements but still a lot of frustration and gaps — and the breathlessly positive articles in out-of-state newspapers and magazines that everything is just peachy. This is their attempt to summarize the situation in a few words, and to explain it to people who don’t know the background, and to focus on what’s worth emulating. Oof, don’t read the comments on that Crosscut piece. People are not adapting as far as I can tell. The streets are now unbelievably clogged with cars at rush-hour and my commute on the 70 has more than doubled. Virginia street is essentially just a solid line of cars now. Busses have to wait at each intersection through multiple light changes as drivers block the intersections and make illegal right turns. SDOT and Seattle Police: Please give tickets to people blocking intersections and crosswalks!! Seattle: give the busses more dedicated lanes!!!! I wonder if banning and enforcing no right turn on red would help at some intersections so that cars going straight also have a chance. I think right on red is banned in most of Manhattan actually. Now if we could just add some more dt bus lines we would be good to go. In the same article on Seattle it claims “daily traffic volumes declined slightly by 5%.” & ” a 19 per cent increase in traffic volume”. Of course, if roads are gridlocked increase in traffic volume is limited to zero but it strikes me as a not well written/researched article to present both as being true. That’s news in itself if traffic volumes have declined. I don’t necessarily trust one fleeting mention that doesn’t give any details, and I’d like to hear more about it. Hong Kong architect James Law’s inventive plan to use converted water pipes to create new single-occupant housing spaces. I’d point out that Lyft stock hasn’t soared the way other high hype IPOs have. It will be very interesting to see what happens now that the initial private capital is attempting to cash in on said hype. Once the free money spigot is shut off companies will no longer be able to “buy” market share (unless, like google and Amazon they benefit from runaway stock prices). Selling stock also means that for the first time the out of balance books will be open to the public. Uber plans to go public this year too which will put further pressure on ride sharing company values.Unless it becomes profitable, and fast, this paradigm of transportation may disappear as quickly as it was created. But, not on the 550. Only the 535, which is much less useful, and has a far more limited schedule. Yeah, it’s only Snohomish County that has embraced the idea of double deckers. I don’t really understand the politics as to why this isn’t an ST as an agency decision. Especially when the claim is the reason they are looking at contracting out eastside service is a lack of storage/base capacity. Bernie: From what I understand, ST doesn’t make overarching decisions to bus vehicle procurement and operations other than deciding whether to approve or not approve bus purchasing requests. And rather that is dealt with at the operator level (CT, PT and KCM who handle the actual operation of ST Express buses). From what I’ve heard, CT is the only one that has OMF facilities that can handle double decker vehicles. So that’s why they’ve been exclusively on SnoCo routes. Although I did speak a PT rep a few months ago at one of the Tacoma Dome Extension open houses and he said that PT has been considering or at least discussing Double Deckers if and when they need to purchase new vehicles to replace old ones like their Gilling Phantoms or the older MCI vehicles. He also mentioned that they would have to build an OMF barn and ask the county or city to do some raising of certain bridges to be able to get clearance for said buses to pass under. Mind you this was a few months ago and I may be remembering some details incorrectly so take what I say with a grain of salt. Can you stand up in the upper storey if you’re taller tan 5’4″? I rode the top of a Snohomish County express once, and it was not very comfortable walking to my seat and back. I have difficulty walking bent down so that exacerbated it, Also, I’ve heard you’re not supposed to supposed to remain seated on the upper storey while the bus was in motion, but I was so afraid I wouldn’t be able to get down to the door while the bus was stopped and I’d miss my stop I went down early early anyway. The lower storey reminded me of a London night owl I took once or twice, but then I stood on the lower storey near the stairs. I am actually somewhat ambivalent about the double deckers. They definitely seem to have longer dwell time than standard articulated buses, in part due to the extra delays waiting for people exiting the bus to climb down the stairs (which, for safety reasons, they can’t do while the bus is in motion). While the seating capacity may be similar to a standard articulated bus, the standing room capacity is a lot less, since the upper floor ceiling really isn’t high enough. I also wonder how the operating costs compare with a normal bus? Does the extra height imply more aerodynamic drag, therefore translating into worse gas mileage? Do double-decker buses cost hundreds of thousands of dollars more to purchase than a capacity-equivalent articulated bus because they don’t benefit from the mass production used to make the articulated buses, since they aren’t used as much? The views are nice, especially at the front of the upper level, but in the end, people are riding bus not for the view, but to actually get somewhere, and the number of seats at the front of the upper level is extremely tiny. That said, I don’t think the above drawbacks matter much for a route like the 535, which travels a long distance between stops and has light passenger volume. It’s a bigger issue for the 512 – even with the long stretches of nonstop freeway, the 512 still takes an enormous amount of time to get from one end of downtown Seattle to the other, and the fact that we have a two-door double-decker instead of a three-door RapidRide-style artic is one of the reasons why. Has anyone dug through the ST reports that can tell us the cost of a double decker vs artic? Also what the seated capacity is? I remember hearing the artics were expensive to buy and maintain because the joint is not an easy piece of engineering. I do know the artics are useless if there is any snow at all on the ground. From what we were told the double talls fit under all normal bridge clearances. It does seem they are best suited for the long haul routes. That said, they seem to do OK in London. The big advantage of course is less space taken up. That I’d think was important DT and certainly with the base area squeeze. How much shorter are our buses than a London Double Decker? I’m 6′ and had no headroom issue over there. 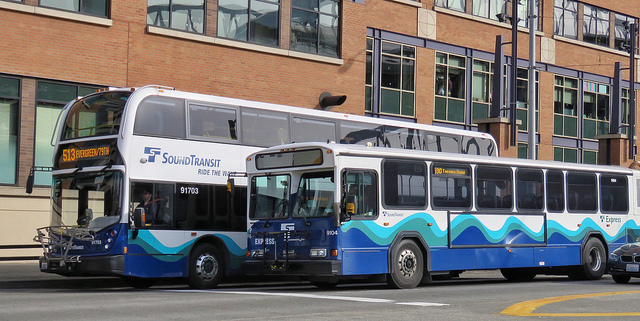 I haven’t had a chance to ride one of the SnoCo buses. The Enviro500 used by Community Transit is 14 feet tall. The Enviro400 used in London ranges up to 14 ft 1 inch tall. Does it really remain stopped long enough for somebody upstairs to get up, walk to the stairs, walk down and out the door? How does the driver know whether somebody is coming to leave it stopped? This doesn’t matter as much at major stops where fifteen people will probably get off, but it does at minor stops where it may be only one person. I believe the driver has a monitor to view the cameras on the upper deck of the bus. In today’s litigious society, I’m amazed that there is not some barrier to accessing the stairwell while the coach is in motion. I wonder how many insurance claims Community Transit has had from people falling down the stairs. Has anyone seriously looked at spending money on hybrid ferries? WSF has some info online but the stats are like trying to discern the meaning of green per days ending in Y. They do give some hard numbers; 18 million gallons of diesel each year. They also talk about zero capital investment techniques that significantly improve efficiency; reducing speeds and .on-board fuel storage to minimize weight load. With respect to weight, even Li-ion doesn’t come close in energy density to diesel. And diesel is actually buoyant (G=0.82 to 0.95). The only reference I found to electric ferries in operation was Finland where they operate on short routes (1.6 km, 520 bridge is 2.35 km) and recharge while loading. Meanwhile, conversion to LNG seems to be “on the back burner” so to speak. Mmm, I wonder what source of energy will be used to generate an increased demand on the grid from electric boats? The energy density for the fuel is not as great, but don’t forget there are also huge Diesel engines and the main generator in the mix, which get replaced by relatively light inverters. A couple of the boats are using EMD engines similar to their locomotive engines. The Norfolk Southern battery locomotive experiment has enough battery power to run for 36 or so hours without recharging. The space required for the fuel is tiny compared to the engine and main generator space that get replaced by the batteries. If they went with a full electric conversion without the hybrid part of things (adding the complexity of both diesel and electric power at the same time) I see no reason why they couldn’t operate without recharge for a similar period. In fact, they could probably operate longer than this because for stability reasons they would need to add a lot of battery weight to get the equivalent weight as the engine and main generator. I hadn’t heard of the NS experiment. It’s pretty cool but it’s still experimental and is it intellectually honest to suggest WSF can throw money at this and expect a result the public will be happy with? It appears that research, at least at any significant development by NS finished in 2014. BNSF and GE have a new project, started in 2018 that should have working prototypes next year. The technology that really seems promising to me from the NS experiment is a “battery tender” that captures energy through regenerative braking that can be reused by diesel electric long haul locomotives. I’d note that employing this technology on a freight locomotive is a much easier problem than for a boat, especially a passenger ferry. Like NS focused their effort on switch engines (the 36 hour charge time) the technology should prove itself on harbor tugs first. I’m not sure I’d classify WSF as “transit” but they haven’t had the best reliability record lately and battery boat idea seems more like a campaign slogan than a viable idea. WSF still has the retired Klahowya at Eagle Harbor. The smart thing to do would be to use it as a test bed before converting the newer boats to something, no matter what the technology is. So far, I’m not too encouraged by the responses I’ve gotten from the various WashDOT and WSF people I’ve attempted to contact. The NS effort is still ongoing, based on some of the things our company has sold them. The only issues I have heard, 3rd or 4th hand mind you, is because the batteries are so much lighter than the engine block they replaced they are having a lot of issues with programming the adhesion control/dynamic brake. Neither apply to a boat. Glenn, fascinating stuff. I don’t know if I’d agree with research grants going toward the Klahowya but you clearly know more than me.With regard to the rail stuff I think it proves that the big stumbling block is battery storage. The carbon batteries I saw referenced in the NS work date back to the early electric cars. As a chemist grad I find this fascinating. Finding a new chemical battery isn’t likely to happen. But making it work is something government needs to fund. The problem with battery technology in freight service is that all other applications (including passenger rail) want light batteries, or at least it doesn’t matter if they are light. In freight service, the heavier the locomotive, the more tractive effort it has and thus the more freight it can move. Thus, they need the battery chemistry, but they also need the weight. Traction control had been under development for some 50! years. For NS to develop their own algorithm is a bit of an undertaking. That’s where the stumbling block really is. I don’t see that adding weight is a technical challenge. This is the article that I thought gave the best insight, A Battery-Powered Alternative. A great reason to use all electric battery power for a switcher is the start, stop wait duty cycle. When an all electric vehicle is going nowhere it’s using no power, well minimal power anyway since it still has electronics to run and climate control. And being that weight isn’t an issue allows them to use lead acid which is cheap and still one of the best choices for deep cycle batteries. The “no brainer” application though seems to be the tender which would go along for the ride with long haul freight and allow regenerative braking instead of dumping all that power through a massive resister bank on top of the locomotive. Rapid charging is an issue with lead acid which might be why they are looking to lead-carbon hybrid batteries for the next generation. Rail really seems like the low hanging fruit compared to electric boats. On a locomotive, the traction control system is money. A 1950’s diesel locomotive with just a sand box might get adhesion of 15%, so a 100 ton locomotive with all axles driven you would get 15 tons of pulling force. Modern traction control can get this up into the 40% range. If you reduce the weight of the locomotive you reduce the tractive force it has. As best as I have been able to understand, this is the part NS is having trouble developing. Boats don’t depend on their own weight to determine how much forward thrust they have. For each hour the ferries spend in motion, they spend what? 20 minutes loading and unloading cars? This stationary to motion ratio seems like it would be easy to convert to electric power. I fully understand why locomotives need to be heavy. It’s why one steam engine could pull an entire train that requires several diesel electric locomotives. But making a locomotive heavy isn’t rocket science. As for the fancy traction control it makes no difference whether the electricity is coming from batteries or a diesel generator. All the long haul locomotives are already driven by electric motors. If anything, a nice stable battery supply makes the electronics easier. And with respect to the regen braking idea for long haul that doesn’t involve traction control at all. It really is all about the battery management which the links I posted bear out. Boats, especially passenger service is a whole nother level of complexity. Keep in mind that substantial portions of America’s railroads (e.g. the Milwaukee Road) were using electric OCS locomotive for freight service over the mountains almost a century ago. They had zero battery weight to aid in traction. Interesting piece. The take home is current “state of the art” is sending an engineer on a junket to Scandinavian to see what’s happening. Everything points to the idea of government spending as seed money to try and build an industry here. We’ve tried that with solar panels. I’m not opposed to “seed money” or research spending but betting the WSF system on it seems extremely foolish. In essence, what’s being proposed is to go from zero to building the worlds largest hybrid ferries in one step. Keep in mind that current law requires ferries to be built in State so it’s a huge slush fund. Assuming the engineering works out, let’s consider what that does to the energy production.Sweden has a small amount of wind generated electricity but the bulk is split almost evenly between hydro and nuclear. So replacing diesel powered boats with electric powered boats actually does reduce fossil fuel consumption. Washington State increased electricity demand comes from burning natural gas. Doubtful there’s any real “climate change” advantage in building hybrid ferries; especially when you look at the environmental cost of building and disposing of the Li-ion batteries. If there is an uber/lyft tax, it should not be in areas that don’t have all-day transit or no transit at all.